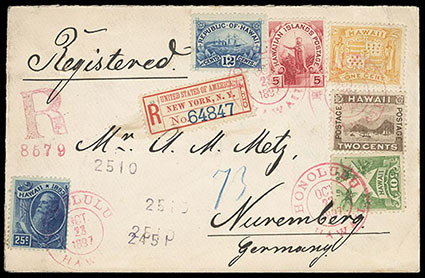 Hawaii, 1894, 1¢-25¢ Republic complete, all tied by red "Honolulu, Hawaii, Oct 23, 1897" cds's on registered cover to Nuremberg, Germany, matching registry handstamp and N.Y. "City" etiquette, appropriate transit backstamps, Very Fine, a lovely complete set on cover. Scott No. 74-79 Estimate $500 - 750. 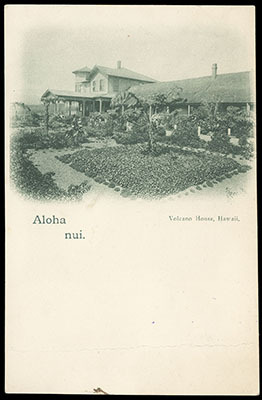 Hawaii, 1894, 2¢ brown, tied by bold purple "Volcano House, Dec 2, 1898" cds (MH 281.02) on unaddressed "Aloha nui., Volcano House, Hawaii" post card with second strike at left; card crease, otherwise Very Fine. Scott No. 75 Estimate $200 - 300. 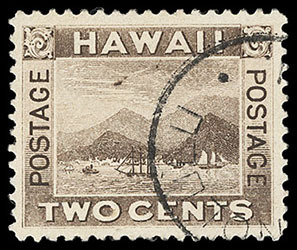 Hawaii, 1894, 2¢ brown, "flying goose" flaw, without gum, choice centering, small flaws, Extremely Fine appearance; with 2013 H.P.S. certificate. 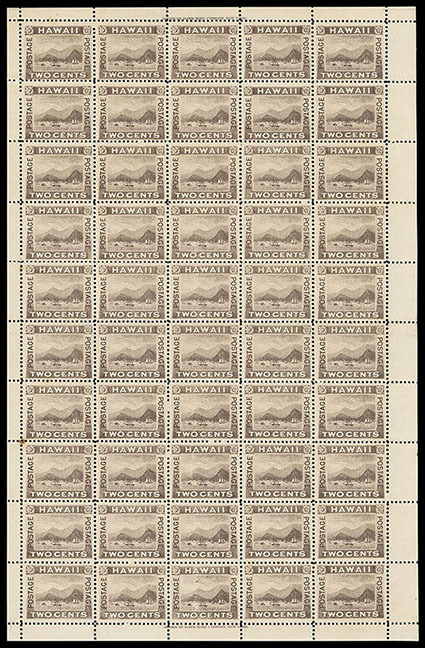 Hawaii, 1894, 2¢ brown, "flying goose" flaw, position 48 in a complete sheet of 50, o.g., never hinged, with imprints in top and bottom selvage, few minor perf separations and gum tone spots away from plate flaw, Very Fine, very scarce as an intact sheet. Scott No. 75 $1,296 for singles. Hawaii, 1894, 2¢ brown, "flying goose" flaw, position 48LR2, neat town cancel, choice centering, bold color, Extremely Fine, a choice example of this scarce plate variety; with 2018 P.F. certificate. 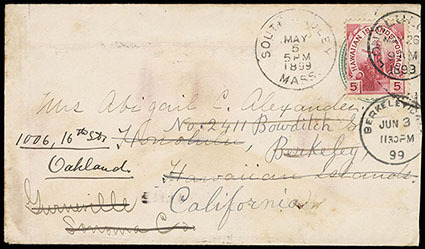 Hawaii, 1894, 5¢ rose lake, tied to interesting multi-forwarded cover that started in U.S. (Mass.) 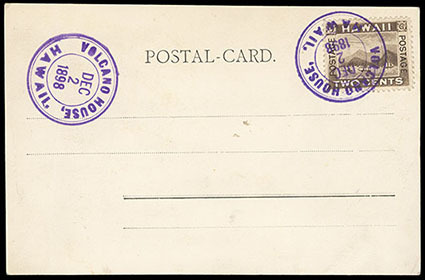 (on U.S. 3¢ stamped envelope), went to Hawaii where the 5¢ was put on, postmarked and then forwarded to Berkeley and then forwarded again, this time to Oakland; 10 different postmarks, Very Fine for this, certainly a unique usage. Scott No. 76 Estimate $300 - 400. 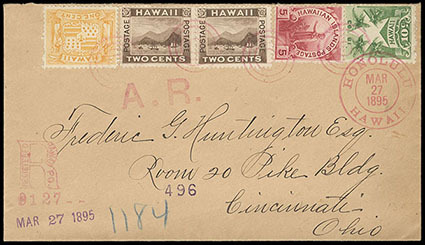 Hawaii, 1894, 10¢ yellow green, in combination with 1894, 1¢ yellow + 2¢ brown, two singles + 5¢ rose lake on registered cover to Cincinnati, O., all tied by target handstamp with matching Honolulu, Hawaii, Mar 27, 1895 cds, registry and return receipt handstamps, Very Fine and choice. Scott No. 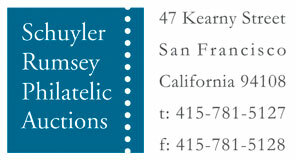 77+74-76 Estimate $200 - 300. Hawaii, 1894, 12¢ blue, bottom sheet margin inscription block of 10, o.g., never hinged except one stamp with small mark, lower left stamp with pinhole as usual, otherwise Very Fine and scarce inscription block. Scott No. 78 $355 as singles. 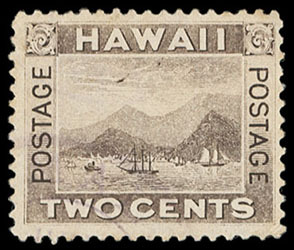 Hawaii, 1894, 25¢ deep blue, in combination with 1894, 10¢ yellow green tied by red "Honolulu, Dec 4, 1895" cds to legal size registered cover front to New Zealand; cover originated from E.W. Holdsworth, designer of the Pictorial stamps, F.-V.F., a very scarce destination. Scott No. 79+77 Estimate $200 - 300. 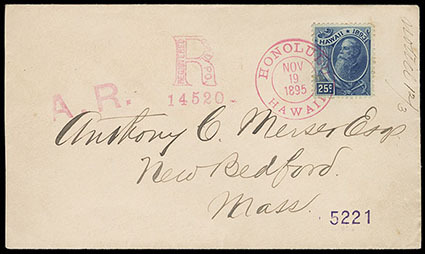 Hawaii, 1894, 25¢ deep blue, tied by red "Honolulu, Hawaii, Nov 19, 1895" cds on cover to New Bedford, Mass., with matching registry and return receipt handstamps, Extremely Fine, very attractive. Scott No. 79 Estimate $200 - 300.